76L configuration is 767-300 with 46J / 22PE / 43E+ / 56E-; fleet to consist of 17 ships (14 former 2-cabin 76C and 3 used ships from Hawaiian). Just wondering about the Y seat count on the new High J map. From the map for 2777/10Mar, 46J and 22PP matches. In the Y section, there are 10 rows of window sets for 40 E+ seats plus a triple behind PP. That looks like 43 E+ and 56 Y seats. Somewhere I had seen the count was to be 47E+ and 52Y. I'm guessing that 43 AB and 44AB, which look like crew seats and are grayed out on the ferry flight. Here's the LOPA that was released/leaked back in April 2018. 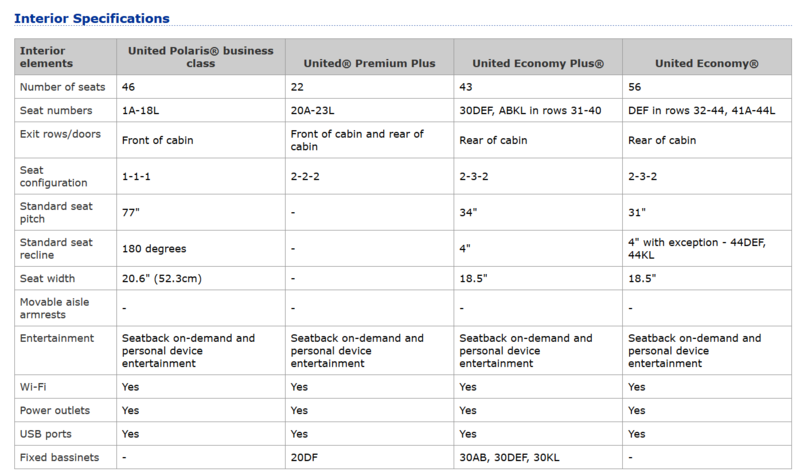 It seems to correspond with the seat map for UA2777. That's 43 E+ and 52 E- (31-44DEF, plus 41-44KL and 41AB), plus crew rests 43-44AB. Presumably the crew rests will be assigned E+ when not required, taking the E+ count up to 47. 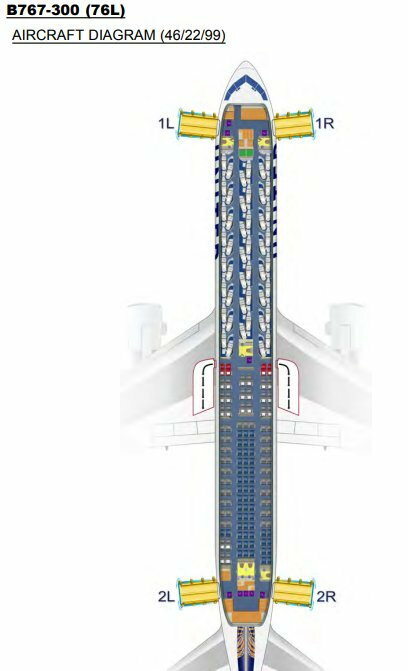 Though on most TATLs when the crew rest seats are required it'll be a 163 seater with 46J/22PP/43E+/52E-. Does that make sense? Fun fact: The first hi-J 767 is on the schedule for EWR LHR this Wednesday March 13 as UA 110.
when I pull that up it's only showing 30J seats? According to FA, it's in ORD now with no further assignment. The seat map is very interesting though. 80% of the Y cabin is Y+ along the windows but standard Y in the middle, all while the row numbers appear to line up and remain even. I realize this is only a graphic and not a true representation, but if the center does in fact have less legroom than the outside, why aren't there a few more rows of seats in the middle? Hopefully someone who flies on this bird can fill us un. I think the DEF seats are actually more forward than they appear on the seat map. The rear galley should take up a lot of real estate and I suspect 44ABKL are next to the galley in fact. It got changed to the next day - 13th now. What timing- on todays blog. Not all 767-300 will have this configeration. Looks like the pre-1998 767-300 will not get the modification. Can he ticket that that way? It sounds like back to back to me. The return, meanwhile, would bring me back from London to Newark, and then from Newark to Frankfurt to catch the above flight to Dubai, for $1,177. Sadly the review, whilst interesting, does not address the OP’s question on the strange configuration in E+. Found another report by Zach showing back sections of the plane. Looks like E+ still has more space. Not sure how they did that without losing row #s .